Christmas is a wonderful time of year. There is no denying that fact. There is also no denying that after Christmas we are left with a huge mess to clean up. I try to stay organized each year, but right at the end all of that organization just seems to go out the window. I am left with holiday décor everywhere, paper, tags, and ribbons in the strangest places. The first step is to pull out all of the Christmas items that you tucked into random drawers and hid in closets and then you will be able to get to work. As with all declutter projects, you are going to be doing a little soul searching. I am a very sentimental person, so if you share the same sentimental heart that I do, you will want to pick a day to declutter and prepare yourself to make some tough decisions. If you desire a home that is organized and uncluttered you can’t keep everything. You just can’t. Put on some comfy clothes and play your favorite music in the background while you declutter. This shouldn’t be painful. Enjoy the freedom that comes from a decluttered home. The best part about decluttering before you put everything away is that you won’t have to store clutter. 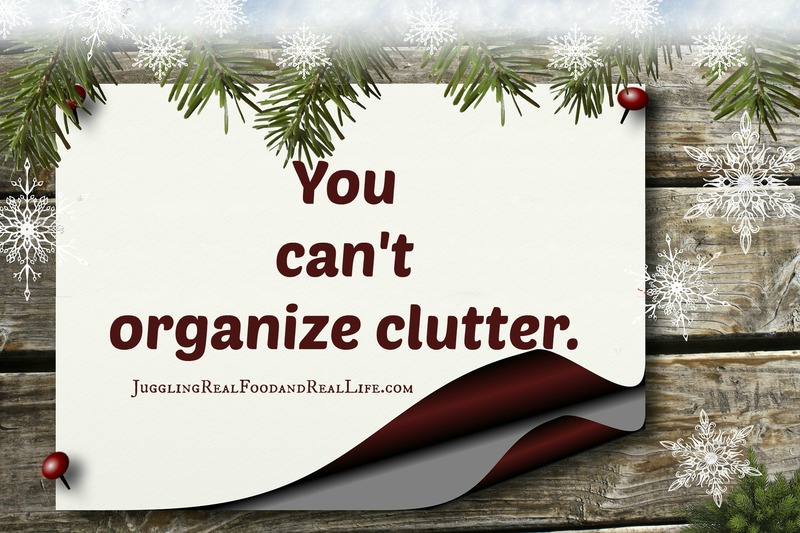 Everyone knows that you just can’t organize clutter so it’s best to part ways with it now when you have time rather than postponing and having to deal with the mess when the holidays get busy again next year. I like to keep my “eye on the prize.” I imagine a decluttered and easy to maintain home and that helps me to keep my focus and stay motivated until decluttering becomes a part of my everyday life. Work quickly….this really shouldn’t take all day. Note from Christina: I am a very frugal person. I don’t like to spend money if I don’t have to, so I tend to keep as much as I can from year to year. However, there comes a point where the mess can take over your life. These suggestions come from my point of view. You should make decisions for your family. Torn Wrapping Paper: I see no problem with keeping paper from year to year as long as you have the space to store it, but if it’s torn or wrinkled just throw it out. Also, make sure you get rid of all of those little pieces you saved…….just in case you might need them. I have tried saving little pieces from year to year, but they just seem to get messed up and never used. You don’t need them. Damaged Gift Boxes: I’m all for being frugal, but if it’s damaged you likely are not going to use the box or you are going to waste a bunch of tape trying to fix it. Tape costs money too, you know! Take inventory as you pack boxes away and only keep the best of the ones you have. Recycle the rest. Used or Damaged Gift Tags: OK……..this is a sentimental area. It seems pretty obvious that you should be tossing out used gift tags, right? Except…….it’s not always that easy when you are sentimental. I still have a beautiful gift tag attached to the first ornament my mother-in-law gave me. She has beautiful handwriting and that gift meant the world to me. Yes, I’m keeping that tag. I also have a few special Santa tags, but the rest……yes they need to go. I also find in the holiday rush that I have tags that get damaged. I’ll never be so desperate for a tag that I use a crinkled tag so toss those too. Tissue Paper, Ribbon, Package Décor: If these items are in good condition and you have room, go ahead and store them away. However, if the tissue paper looks like someone blew their nose in it, the ribbon is frayed, and the gingerbread boy package topper is missing an arm. Ditch it! Christmas/New Year Cracker Contents: You know those cute little tubes that you use to celebrate the holidays with? I love those things! I proudly wear my paper crown and play with my little toy for like maybe a day. Then, after that……….that garbage has to disappear. I really hope that my kids prefer the gifts I purchased them for Christmas over those paper crowns. I haven’t had a complaint yet and to be honest………I don’t think they even notice when that stuff goes missing. 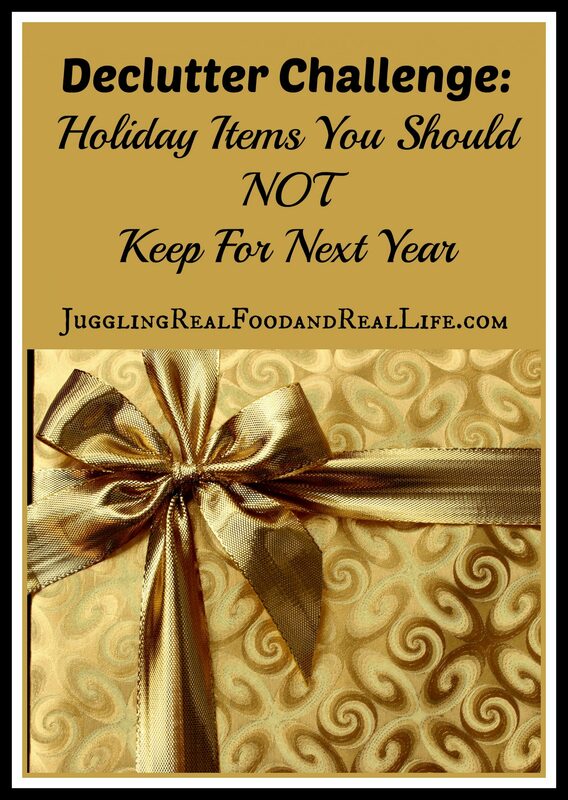 Gifts You Won’t Use (Including Gag Gifts): Christmas is full of gifts that are given because someone feels they “have to” give a gift. I like to give gift cards and edible gifts in this situation, but not everybody is like me. Some people try really hard to give gifts, but don’t know my tastes. I appreciate the gifts, but if I wouldn’t buy it for myself, does it really need to be in my house? I would much rather let it be a blessing to someone who needs or wants it. And there are those gag gifts that your crazy relatives like to give you. There are only so many whoopee cushions one house can hold. Am I right? Real Greenery Wreaths: Just throw it away! It’s a fire hazard. Greenery wreaths are so beautiful during the holidays, but once they are all dried out, they really should be thrown away. Window Decals and Paper Cut-Outs: I don’t use window decals too much anymore, but I used to have window decals for every holiday. I tried to keep them from year to year, but they never looked as nice as the first year. They seem to wrinkle and no longer stick right. Toss them out now before they get ruined in a box. Placeholder or Temporary Holiday Décor: When you are first starting out, you often buy décor for the holidays. Let’s be honest……….that stuff is probably not heirloom quality. If you paid a dollar for it at the Dollar Tree (love that place!) there likely is not a need to hold on to it from year to year. Again……..use your judgment. If the décor is of a nice quality and you really love it go ahead and hold on to it. However, if most of the glitter has already fallen off, you may want to consider tossing it. Broken Décor and Lights: There is nothing more frustrating than starting your holiday decorating to only discover broken ornaments and other décor. Either fix it right away or part ways with it. Anything You Don’t Love: This can be difficult if you are sentimental, but if you don’t love it, why are you holding on to it? I had a hard time tossing out a snowglobe that I love this year. Something happened to it and the water was all rusty looking. I certainly don’t want to put it out in my house. I finally threw it away. I have lots of pictures of it from over the years and I would much rather remember how beautiful it was than how ugly it had become. Christmas Cards: If you are sentimental like I am Christmas cards are especially difficult to part with. I love Christmas cards. Each one is a special gift from someone I love. I know there is lots of advice to not even send Christmas cards, but I would hate that to happen. Christmas is the only time of the year that I actually like to get the mail. I came up with a plan though so I don’t keep all of the cards that my loved ones have sent me for that past 20 or so years. I keep the picture cards and put them in a scrapbook. Easy peasy and not too fancy. A simple scrapbook with the pictures you have sent me over the years. I love watching your kids grow up right in front of my eyes. I also have a small box that I keep the other cards in. I keep super special……..like my Mom or Aunt made them. I also keep the “last” card that I receive from my loved ones. I replace last year’s card with the card that was sent this year and then toss out last year. That way I always have the “last card” that was sent. As I go through the cards, I cherish seeing old familiar handwriting that I no longer get to see. I shed a few tears, think of special moments spent together, say a prayer, and then put the box away till next year. OK……..so now it’s your turn. Leave me a comment below and let me know what I should no longer be keeping from year to year. Are you sentimental or do you find it easy to purge things you no longer need or love? Are you ready to challenge yourself to healthier eating this year? Come on over and check out The Real Food Experience. It’s an easy systematic approach to eating more real food……….even if you have a busy schedule. Come on over and check out the details . You may also be interested in more Decluttering Challenges. You can check those out by clicking the pictures below. « Real Food Experience Week 1: Let’s Get Organized! Done…well except the cracker contents 🙂 I love my crown and ours came with a set of small musical recorders, we all laughed so hard while we tried to play the simple musical score. I know, I know I am trying to justify keeping these! We all have different priorities Janelle! Wear your crown proudly and let me hear that music ring out loud and clear. Great job on taking care of the rest of the mess. Just when I think I’m done………I discover one more piece of tissue. I really stuffed my mess everywhere at the last minute. Still, it feels nice to be storing clutter. Love this! Especially “Anything you don’t love.” This is a lesson I am trying to learn in every aspect of my life and home. I just never thought about it for my Christmas decos. I should gut my storage area and get rid of everything left in there (we haven’t take down or decorations yet – the grand baby is coming for a visit in two weeks.) If I didn’t love it enough to use it this year, I shouldn’t waste my time storing it for next year, right? Thanks for the inspiration!